The Tacoma Waterfront is a paved sidewalk along the Puget Sound’s Commencement Bay ideal for walkers, joggers or those out to dine at restaurants with a view (there are several here). In years past, the Waterfront included a two-mile stretch of sidewalk paralleled by Ruston Way, but now the path stretches all the way to Point Ruston near the very northern tip of Tacoma. End to end, the sidewalk is now more than three miles. The result? There's a lot of space to enjoy some of Tacoma's most scenic views, but things to do on the Waterfront are only on the rise with the addition of Point Ruston. Here are a few things worth checking out on this scenic strip. The restaurants are a major reason to come to the Waterfront for their variety of cuisines, price points and beautiful views of Commencement Bay. All have outdoor seating when the weather is warm and views of the water all year (but if you want to guarantee a window seat, make reservations or come during off-peak hours)! Harbor Lights: An Anthony’s chain restaurant, Harbor Lights serves mostly seafood entrees, soups, salads, desserts and a few non-seafood entrees as well. Ram Restaurant and Brewery: One of the better deals on the waterfront, the Ram is the place to get burgers, sandwiches, steakhouse-style entrees and microbrews. C.I. Shenanigan’s: Creative yet still approachable entrees and sandwiches, C.I. Shenanigan's has plenty of seafood options, but there are lots of options with chicken and beef as well. Katie Downs Waterfront Tavern: Soups, salads, pizzas, burgers, seafood and steak entrees along with beer and wine in a casual atmosphere. Duke’s Chowder House: Duke’s has unique and delicious chowders along with a full menu of seafood entrees. Lobster Shop: The Lobster Shop has higher quality seafood entrees and appetizers, and surprisingly, one of the best breakfasts in Tacoma with its Sunday Brunch. Farrelli's Pizza: If what you seek is pizza, look no further. This chain pizza joint has higher end pizzas as well as traditional favorites, soups, salads and entrees. WildFin American Grill: WildFin serves fresh fish, seafood and Northwest meats with a view in a nicer atmosphere. Stack 571: Stack 571 is a burger restaurant, but its burgers are innovative with high-quality ingredients. Fish Brewing Pub & Eatery: This Olympia-based brewery brings its crisp ciders and delicious microbrew to the Tacoma waterfront. The food menu has something for everyone, including vegans and gluten-free diners. Mio Sushi: Mio is a family-friendly sushi restaurant that also has bentos, entrees, salads and a kids menu (no chicken nuggets and fries here, though). Anthem: Anthem is a coffee shop with a focus on community and handcrafted food and beverages. Expect hot and cold caffeinated beverages, and a nice menu of sandwiches, pizzas and snacks made in house. Jewel Box Cafe: Grab an espresso or latte as well as breakfast or lunch as this cafe has a tasty menu filled with crepes, sandwiches, panini and more. A number of parks are located along Ruston Way. None are large, but offer patches of grass to picnic, play or just enjoy the view. The parks along the Waterfront are: Jack Hyde Park, Hamilton Park (possibly the tiniest park in Tacoma! ), Dickman Mill Park, Marine Park and Cummings Park. At the far southern end of the Waterfront is the Chinese Reconciliation Park, a beautiful and serene place to relax, but also to learn a bit about Tacoma's history via the plaques located around the park. Chinese Reconciliation Park is also one of the best places for photographers area. The Les Davis Fishing Pier is also a great spot to go whether you want to fish or not. A little bit down the pier, if you look over the side, you can often see starfish. The end of the pier has views of Mount Rainier, downtown, and the Port of Tacoma. Sure, you can explore the Waterfront with your own two feet, but if you want to kick things up a notch, take in the scenery in a different way. Tacoma's only parasailing outfit, Pacific Parasail, launches from the Tacoma Waterfront just behind The Ram. Riders can go up single, double or triple (depending on weight) and will get a view from several hundred feet up in the air of the water, surrounding islands and land masses, the Port of Tacoma and Mt. Rainier in the distance. From high up, the air is pretty quiet and you can spot a lot of marine birds and seals, too. Point Ruston is a development at the north end of the Waterfront that includes condos, apartments, retail space, a theater as well as a path along the water. It adds a retail edge to this end of the Waterfront and includes the only major theater in the Tacoma city limits. There are restaurants and cafes to enjoy as well, but perhaps the best part are the views of the water and Mt. Rainier. You can also rent bikes and other wheeled, non-motorized vehicles from Wheel Fun Rentals. Another way to enjoy the views and stay off your feet is from a wheeled, non-motorized vehicle. Wheel Fun Rentals is based near Point Ruston and rents out bikes, surreys (four-wheeled contraptions great for families), and three- and four-wheeled vehicles somewhat like a giant Big Wheel. Especially for families, this can be a lot of fun, but even if you don't have kids, rolling past the scenery in style is a nice change of pace. However, keep in mind that the Waterfront does have very busy days on nicer weekends so go during off-peak hours if you have the need for speed. The Tacoma Waterfront is part of Tacoma’s history from its very early days. The Ruston Way area, then called Front Street, was lined with industry—boatyards, warehouses and mills. Visitors to the Waterfront today can see remnants of this booming time even now—a circular base of a grain mill, wooden pylons sticking out of the water, bricks among the rocks on the beach. In the 1920s, the industry of Ruston Way began to move toward the Tide Flats of Tacoma, which remain the center of industry in the city today. Some of the industrial remnants also look great in photos. There is only one hotel along the Waterfront—the Silver Cloud Inn. 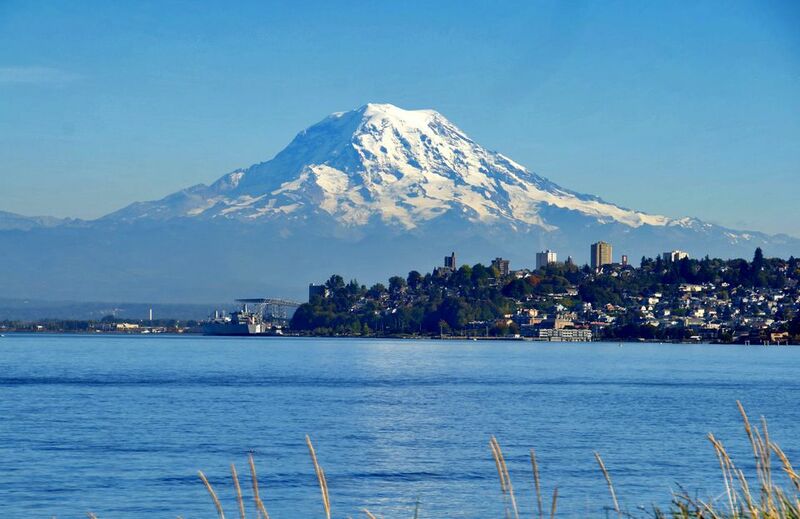 It has great views of the water, but prices can shoot up around major events and any other reason people would flood Tacoma hotels (conventions downtown and parent weekends at local universities). Still, a stay at Tacoma's only waterfront hotel can be a great staycation! Or, if you're from out of town, this is one of the best hotels in the area to stay.